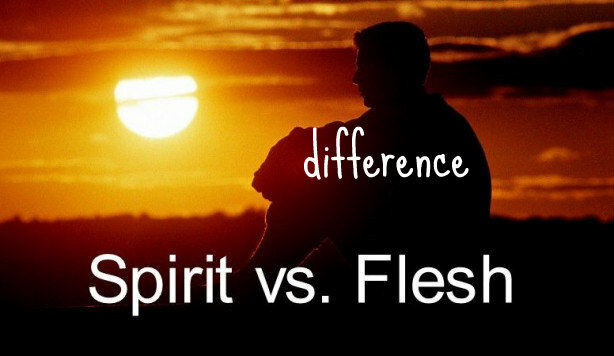 The difference of the flesh and the spirit – I Am Not Ashamed Of The Gospel Of Christ! Scripture teaches us that the flesh wars against the spirit,and just so we are not left not knowing the difference we see in the book of Galatians the works of the flesh compared to the spirit.We as christians are not suppose to bite and devour each other to get a point across as the flesh would like to do,but by the fruit of the spirit have temperance and by crucifying the flesh we avoid causing strife and division in the body of Christ! (Galatians 3:13-26). 13 For, brethren, ye have been called unto liberty; only use not liberty for an occasion to the flesh, but by love serve one another.14 For all the law is fulfilled in one word, even in this; Thou shalt love thy neighbour as thyself.15 But if ye bite and devour one another, take heed that ye be not consumed one of another.16 This I say then, Walk in the Spirit, and ye shall not fulfil the lust of the flesh.17 For the flesh lusteth against the Spirit, and the Spirit against the flesh: and these are contrary the one to the other: so that ye cannot do the things that ye would.18 But if ye be led of the Spirit, ye are not under the law.19 Now the works of the flesh are manifest, which are these; Adultery, fornication, uncleanness, lasciviousness,20 Idolatry, witchcraft, hatred, variance, emulations, wrath, strife, seditions, heresies,21 Envyings, murders, drunkenness, revellings, and such like: of the which I tell you before, as I have also told you in time past, that they which do such things shall not inherit the kingdom of God.22 But the fruit of the Spirit is love, joy, peace, longsuffering, gentleness, goodness, faith,23 Meekness, temperance: against such there is no law.24 And they that are Christ’s have crucified the flesh with the affections and lusts.25 If we live in the Spirit, let us also walk in the Spirit.26 Let us not be desirous of vain glory, provoking one another, envying one another.